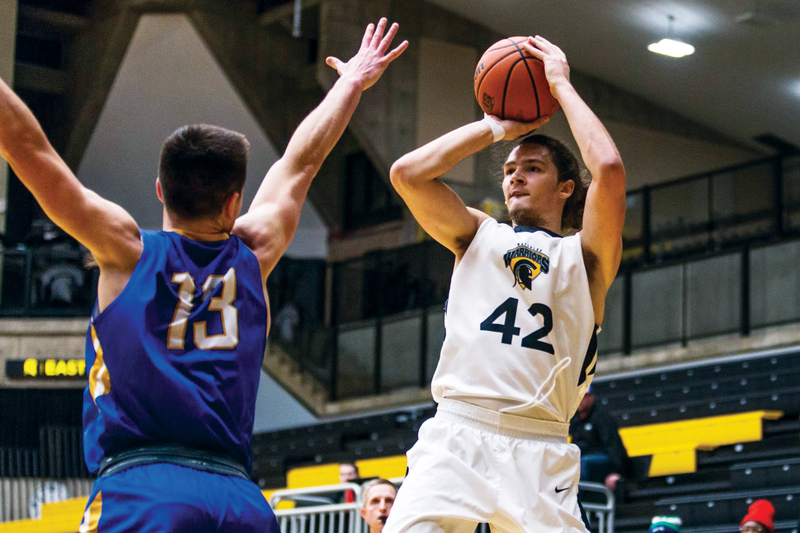 The dynamic duo of Nedim Hodzic and Simon Petrov scored a total of 55 points for the Warriors’ Men’s Basketball Team. This explosive performance was enough to guarantee a win for the Warriors over the York Lions, 96-91. The game is best described as a tug-of-war between both the teams. The Warriors led the first and second quarters by just a single point and it was the third quarter which proved to be decisive for the game as Warriors, by the end of the third quarter, accumulated a lead of six points. The Lions, however, deemed the game to be far from over as they cut the Warriors’ lead to just a single point in the fourth quarter. But The Warriors, Justin Malnerich and Colin Connors had other ideas as they decided to quash this late comeback with a lethal combination of some marvellous three pointers. Hodzic came out of the game with 28 points, highest for the Warriors, 15 rebounds and 4 assists. The numbers he put up against the Lions are just unbelievable and judging by these numbers it looks like he was the major reason Warriors were able to taste victory against the Lions. He had 52.6 percent from the FG and missed just one shot out of the nine he threw from the line. Not only that, he was also present on the defensive end of the game as he contributed a steal and two blocks for the Warriors. Petrov, on the other hand, contributed 27 points, had a field goal percentage of 52.9 and had a 100 percent conversion from the charity stripe.“It was a good road win for us. Nedim and Simon led us and we got great contributions from the entire roster,” said head coach Justin Gunter. Warriors had a near perfect record from the free throw line as they missed just 4 free throws out of their 30 attempts. Meanwhile the Lions from the free throw line scored just 73.1 percent of their attempts.Connors and Malnerich provided the late impetus for the Warriors to help them win the game. They scored a combined total of 31 points, in the process scoring a combined 9 three-pointers. In fact, all of Connors points came from three-pointers. Such impact from the bench really showed the Warriors’ depth and class. “Colin and Justin going 9-16 from three was huge for us. They made several key three’s in the second half, which halted York’s momentum,” mentioned Coach Gunter. If the Warriors keep the momentum going then they have a real chance at winnig some trophies this season. With players like Hodzic and Petrov on the basketball team, and at the same time the strong recruitment on the Warriors’ football team, the upcoming years for all sports teams at UW are very crucial. Success breeds success and if the Warriors win championships, then dynasties can be established. All the Warriors need is consistency.